Faced with changes to US immigration legislation that could threaten educational and cultural exchanges in the country, WYSE Travel Confederation presents its own research which shows the major social and economic benefits that such exchanges bring to communities across the US every year. Last week we expressed our grave concern that the US may be turning its back on this cornerstone of US public diplomacy. As our research shows, such a move also stands to have a negative impact on the US economy too. Our research, taken from the latest New Horizons III study shows that the United Kingdom and China were the biggest source markets for work experience programmes globally. Major developed nations such as Germany, France and Canada were also major source markets for those participating in work experience programmes. Mexico, Russia and Brazil are all recognised as being of major importance to US Foreign Relations and also represent important source markets for this sector. 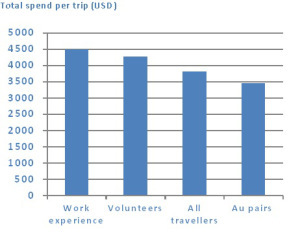 Spending among those who work and travel is greater (average spend: $4500 per trip) than spending by travellers generally (at $3800 per trip). The bulk of travellers spending goes directly to local businesses and municipalities in the form of sales and tax receipts as funds are mainly spent, whether in the host community or through an extended period of travel, on accommodation, food & drink, activities and entertainment. Whether as a source of tax income, skills or innovation, work experience participants on the J-1 visa programme give an important boost to the US economy. The desire to ‘increase my knowledge’, ‘explore other cultures’, ‘experience life in another country’, ‘interact with local people’ and ‘build friendships’ were the top five factors chosen in our study. Such motivations were even more common for work experience participants than for travellers generally. Originally conceived more than 50 years ago as a means of giving young individuals from overseas first-hand experience of American cultural life , the J-1 visa programme meets the desire of work experience participants to experience life in US society close-up. 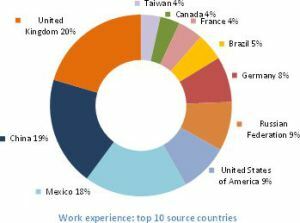 The United States is the world’s leading work experience destination and derives many benefits from the personal ties that are made with citizens of countries of strategic importance. Work experience travellers bring in more money than they earn in a country. Money earned whilst travelling is re-invested in the host country and is more likely to reach local communities and businesses than the average tourist dollar. Structured work experience programmes in the US offer young people from around the world a unique chance to learn about life in the US and build connections with US citizens that last a lifetime. Learn more about the Immigration Reform Bill and what you can do to protect cultural and educational exchange programs in the US. For additional information please contact WYSE Travel Confederation Marketing and Communications Dept: communications@wysetc.org Tel: +31 2042 12800.